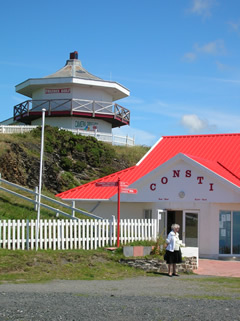 Constitution Hill is a great place to visit for all the family, and once you’re at the summit there are plenty of fun things to do, truly something for everyone. If you’re feeling adventurous you can wander up the winding footpath, or tire the kids out in our newly refurbished games room. If you want to do nothing, you can do that too, just sit back, relax and take in the beautiful views with a coffee and some lovely cake. The Café serves meals and snacks all day, so you can have a well deserved cup of delicious cream tea or coffee, all rounded off with one of our wide selection of fresh cakes. 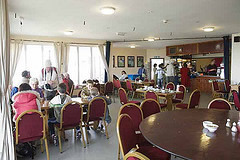 Our friendly and welcoming staff are always ready to help and we make an effort to provide meals and drinks suitable for people with special dietary requirements. The café also boasts a fully licensed bar and what must surely be the largest beer garden in Aberystwyth! With stunning views why not book an evening meal with us and watch the sun setting over Cardigan Bay. We are able to cater functions and large group bookings including children’s and wedding parties, and with an in house disco available, you really can’t go wrong! Group restaurant bookings and functions travel free on the funicular railway when booking a three course meal. If you’re looking for that special venue, give us a call on 01970 617642 today. Recently the ever popular games room has undergone a makeover which has seen the introduction of twin lane ten-pin bowling to Constitution Hill. Coupled with the old favourites including pool and air hockey and with a new drinks and ice cream kiosk, it's the perfect place to keep the kids entertained while you relax with a coffee and a cream cake or two. 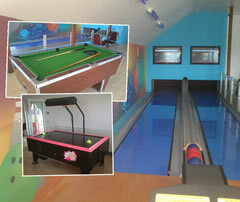 The games room is available for hire and package deals are available, so you can provide the perfect setting for your childs birthday party or celebration. Booking couldn't be simpler, give us a call on 01970 617642 for more details! The first camera obscura was built in Aberystwyth in 1880 in the castle grounds at the opposite end of the promenade, and was later re-located to Constitution Hill to create a better viewpoint. Sadly, by the 1920's it had gone - a casualty of the public's changing demand for entertainment. This popular re-creation of a Victorian amusement has been one of the prime attractions in the area since its completion in 1985. The massive 14 inch lens makes it one of the world’s largest camera obscuras and visitors can view the moving colour pictures that fascinated our forefathers. In our viewing gallery it is possible to observe 1000 square miles of land and seascape with remarkable clarity. Today, our visitors benefit from a level of precision and clarity that the Victorians could barely dream of, and the delightful present day camera obscura was almost entirely designed and manufactured here in Wales. It provides a fascinating learning experience for the entire family, whether you wish to understand more about optical technology or simply spy on friends on the beach! No trip to the west coast of Wales would be complete without experiencing the great Aberystwyth Camera Obscura. Please note: The Camera Obscura is closed from November to March. Frisbee golf is free to play on top of Constitution Hill, just pack up the frisbee and head up for an energetic game with friends or family! Frisbee’s are also available in the gift shop. Follow the coastal path down to Clarach and explore what Mid-Wales has to offer while enjoying panaromic views over Cardigan Bay stretching all the way beyond Aberdyfi. FREE use of the bouncy castle! Available from Easter take advantage of our free bouncy castle to keep the kids entertained. (Not available during inclement weather). To find out more about what Constitution Hill has to offer, please call us on 01970 617642 today.